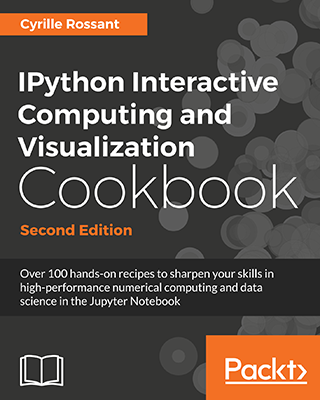 IPython Interactive Computing and Visualization Cookbook, Second Edition (2018), by Cyrille Rossant, contains over 100 hands-on recipes on high-performance numerical computing and data science in the Jupyter Notebook. Most of the book is freely available on this website (CC-BY-NC-ND license). Recipes marked with an asterisk * are only available in the book. For any comment, question, or error, please open an issue or propose a pull request.